May 1st will mark the one year anniversary for Studio on Main. Seems like just yesterday I was hanging the sign out front and crossing my fingers that someone would come. To thank you for your continued support I’m pampering you with a rare massage special. Reduce stress and ease your aches and pains by purchasing a limited offer coupon – buy one massage / get one free! Contact the studio for details. Tomorrow is the big day! Six months in business and still growing. Remember there are two ways to celebrate. 1. All one hour Swedish Massages for November and December 2013 will be only $60.00!! That’s $20.00 off the regular price. 2. Start your holiday shopping here in the studio. 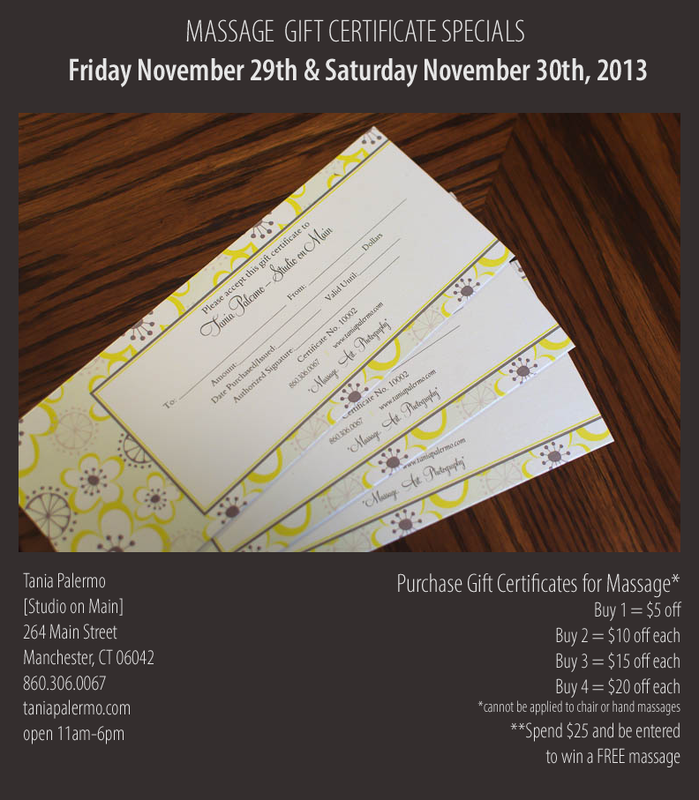 Anyone who spends $25.00 in November will be entered to win a 30 minute massage in December. 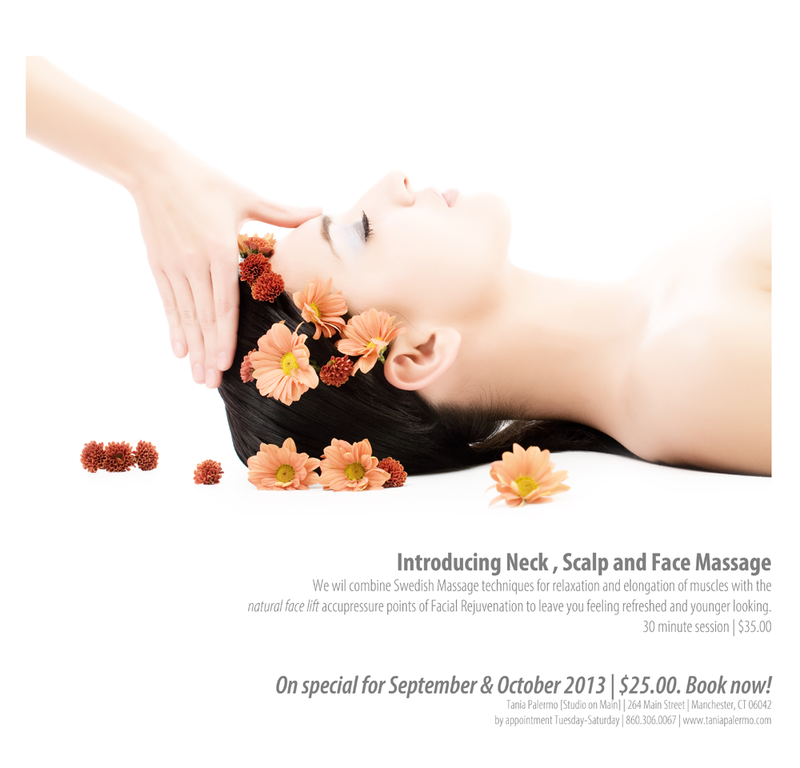 Neck, Scalp & Face Massage!! We will combine Swedish massage techniques for relaxation and elongation of the muscles with the natural face lift reflexology points of Facial Rejuvenation to leave you feeling refreshed and younger looking. Normally $35.00 for 30 minutes this new treatment is on special for September/October 2013 for only $25.00. Book now! 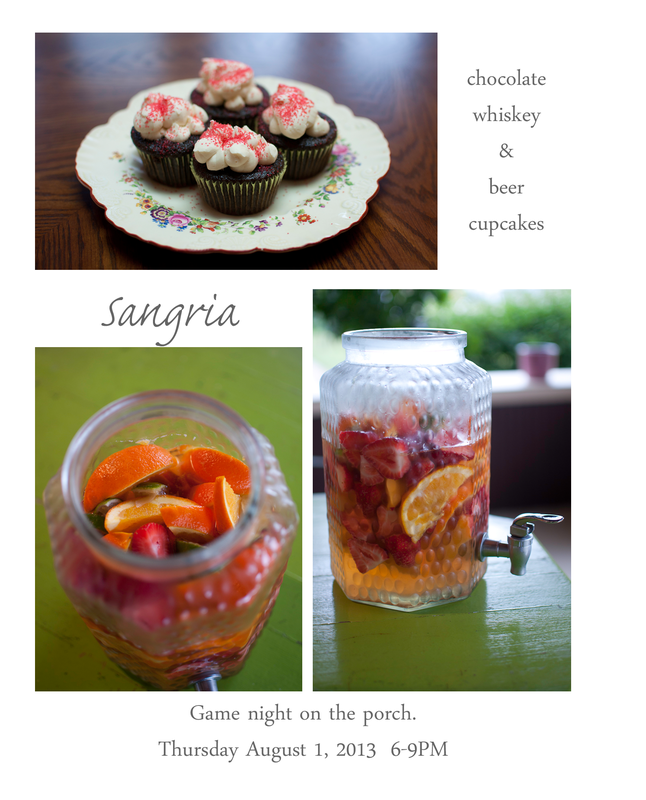 We are having our second “game night on the porch” this evening. Come play old school board games, have a homemade chocolate whiskey and beer cupcake (AKA Irish Car Bomb Cupcakes) and a glass of white wine Sangria!! We will be offering chair massage for $10.00 and hand massage for $5.00 between 6 pm and 8 pm (normally $12 and $10 – cash only). As always you can browse through our art gallery and come meet new friends. I’ve read two articles recently about the benefits that massage can have for people suffering with anxiety and / or addiction. One of the biggest things I’ve witnessed on my table repeatedly is just how quickly safe, therapeutic touch can help a person to be more fully grounded in their body. We spend so much time in our heads every day – worrying about the hundreds of things we need to accomplish, wondering if we are doing OK as a parent; friend; business owner…hoping that soon life will get easier. All of that thinking and worrying increases our stress levels and specifically raises the levels of cortisol in our bodies. That can put us into a cycle of feeling run down, often leaving us with decreased immune system functioning, tiredness and lack of patience, etc A one hour Swedish massage can aid in breaking that stress cycle. I’ve had clients come in for massage practically bouncing off the walls from the busyness of their lives – their levels of anxiety are high. Many of them, somewhere in our session time, will heave a huge sigh of relief and settle in – shifting from existing just mentally to really sinking down “into themselves/their bodies”. It’s not uncommon for people to shed tears as a way to release tension. They really get in touch with the effects life is having on them and are able to experience a sense of peace and well-being, often for the first time in many months. Massage has been proven to increase dopamine and serotonin and decrease cortisol – all of which can help alleviate depression and anxiety and help support you in making healthier self-care choices. We’d love for you to experience the benefits of massage first hand. Please check out our massage specials for July and August here.